By checking your blood glucose often, you can reduce your risk of complications from diabetes. You might think that your blood glucose numbers as something for your doctor to deal with. The truth is, though, that blood glucose numbers are useful for you, too. Blood glucose monitoring helps you to self-manage you diabetes. Let’s take a look at how checking your blood glucose can help you to achieve control and live healthy with diabetes. Why should you check your blood glucose? You will know how exercise affects you, and you will get more exercise. Check your blood glucose before and after you exercise. 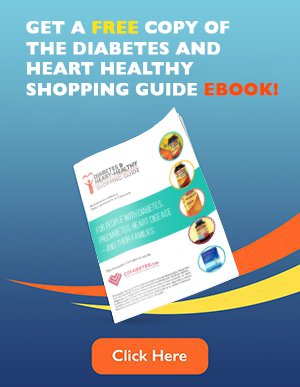 You will know how the activity affects your blood glucose. You will see that after eating a high carbohydrate meal, a 45 minute walk brings your blood glucose down into your target range. Then you will be more likely to repeat the exercise to get good blood glucose control. It’s motivating! You will know how food affects your blood glucose, and you will eat healthy foods. Check your blood glucose before and after you eat. You will know how food affects your blood glucose. Then you can adjust your portions and carbohydrate amounts for each meal to achieve your target range for blood glucose. This helps you to see what foods raise your blood glucose. Then you can eat those foods in small amounts, or less frequently. You will know if you have a low or a high blood glucose, and treat it quickly. 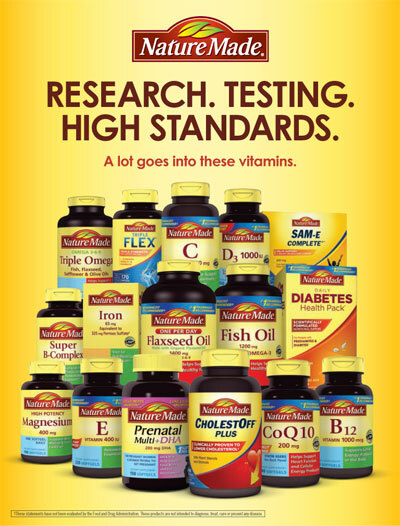 Low blood glucose symptoms, such as being shaky, sweaty, or confused, come on fast. Check your blood glucose at the first sign of a low glucose (less than 70 mg/dL). Then you will know that you need to eat an extra 15-20 grams of quick-acting carbohydrates to bring up your low blood glucose. 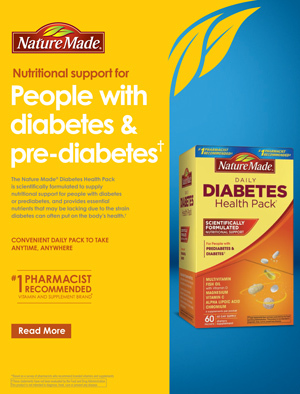 You could use 3-4 peppermints, lifesavers, or glucose tablets to bring up a low blood glucose. High blood glucose symptoms come on slowly. You will recognize your patterns in your blood glucose when you check it often. Then you can call your doctor and get prompt treatment if you have more than 2 blood glucose readings over 240 mg/dl in a 24-hour period. Be sure to drink plenty of water, take your medications, and see your doctor. This new meter from OneTouch has a sleek, hand-held design. It comes with Bluetooth to automatically send readings to a smart phone or tablet, or you can connect through directly to your computer. 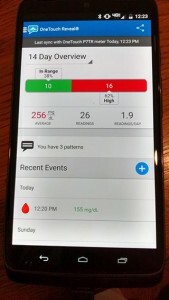 The OneTouch Reveal App for Android or iPhone allows you to track your progress, and share blood glucose reports with your health care provider. OneTouch products have the lowest co-pay on the most health plans and are always covered on Medicare Part B. 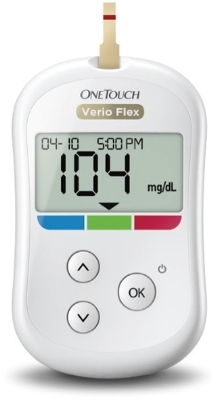 The OneTouch Verio Flex Blood Glucose meter has ColorSure™ technology to let you know instantly whether your blood glucose readings are low, in range or high.